In order to check out books the following week, students must return their books or renew them, if needed. The maximum book checkout includes any class assignment or research books requested by the teacher. Overdue Books: Students may keep books for one week. If the book is not returned when due, the student will not be able to check out a new one until it is returned or marked as lost with replacement cost received. Lost or Damaged Books: If a book is lost or damaged beyond repair, the student is charged the replacement cost of the book. Please monitor your kids and ensure they are taking care of borrowed materials from the library. Read them with clean hands. Please no eating or drinking (especially sticky or greasy foods) when they are reading their books. No writing or coloring in books. Keep library materials away from pets and young siblings. Keep books clean and dry. *Tip – provide a large or oversize ziplock bag for your kids to put their library books in while in their backpacks. This keeps the books from getting bent, ripped and wet should their water bottle leak. Do not take your library books into the bathroom to read. Keep them safe in your backpack so the pages and covers do not get bent or torn. Don’t drop, throw, kick, toss, etc. them or leave them outside. Please take care of our school’s library books so that others may enjoy them for years to come. 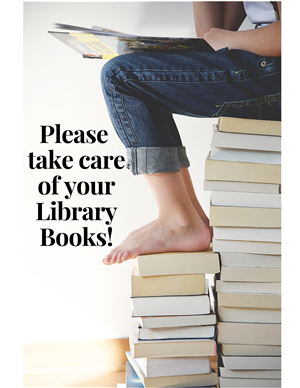 If you check out a book and notice damage, tell Mrs. O’Hara or Dr. Winkler right away and return your library books on time!